If you're tired of the same old workouts, look no further! HGH Factor may help you pack on lean muscle while improving performance to take your workouts to the next level. Take two (2) capsules with breakfast. It can also be taken as a pre-workout supplement with a small meal or a protein shake. L-Arginine may support faster healing to cut down on recovery time. L-Ornithine may help rejuvenate your straining muscles. L-Glutamine might also reduce recovery time between workouts, to get you back in the gym or on the field. L-Glycine may help support muscle growth and strength. L-Isoleucine might improve endurance and energy levels and decrease fatigue. L-Lysine may support healthy weight loss. L-Valine may help with muscle repair and growth. Astragalus Root is believed to have numerous health benefits. It may improve the immune system, keeping the body strong and healthy. Panax Notoginseng, when used in conjunction with astragalus, it may enhance endurance and stamina to power through tough workouts. 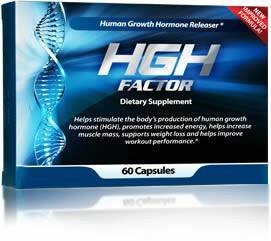 HGH Factor may help you train harder, have more energy, and get the best results you can from your workouts. HGH Factor is a natural supplement with ingredients designed to help you get the lean gains you want, and may yield the results you've been looking for.